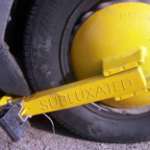 You woke up this morning, tried to get out of bed only to discover your back is completely locked up – like a steel parking boot has been slapped on it, rendering your whole body UN-driveable. Maybe you should have paid more attention to the warning signs that were piling up over the past several months. Neglect is the enemy of normal function. That little twinge in your back you felt a few days ago, the morning soreness you’ve been getting more often, think of them as ‘parking tickets’ warning you to get in compliance with the laws spinal maintenance or pay a heftier penalty down the road. When you continue to ignore ticket after ticket, don’t be surprised if one day you find your entire spine seized and locked out of commission. That’s what happens when subluxations go unchecked and uncorrected. So the lesson of the story…don’t wait for your spinal issues to get out of hand before doing something about it. Be responsible…take care of the small infractions (subluxations) in your spine now before they lead to bigger problems in the future.